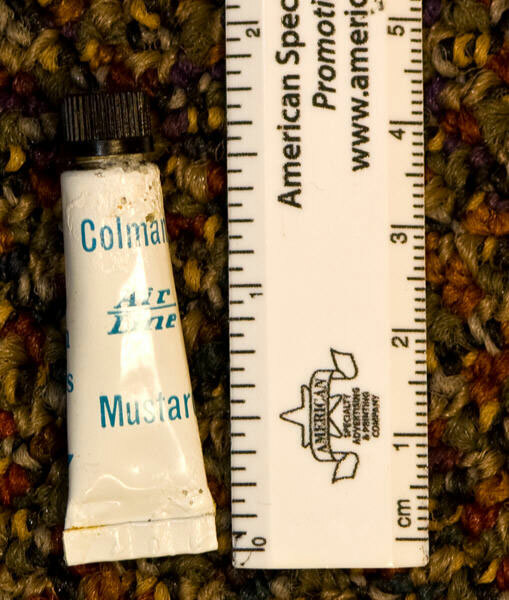 Thank you to Alice Donahue at the National Electronics Museum for sending us this curious little tube of Colman’s mustard that was served on certain British Airways flights. When we say “little,” we mean tiny. We have never seen a tube this small. It is now in our collection of Colman’s memorabilia on display at the Mustard Museum. What a great idea! Airlines, if you’re paying attention, if you’re going to hand out those little bags of pretzels, hand out some little tubes of mustard, too!